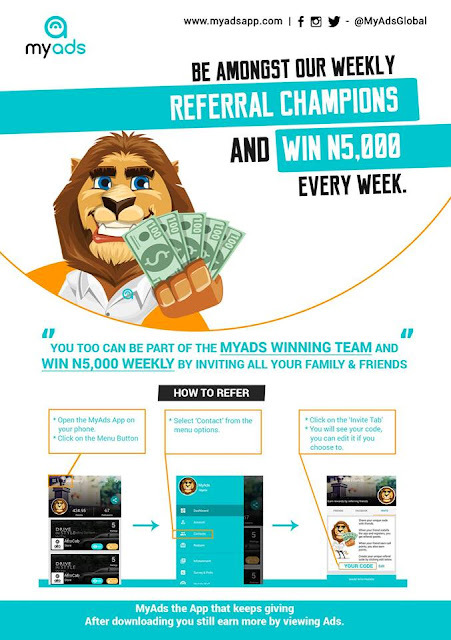 MyAds is a mobile app that beautifies your incoming call screen and pays you for it and when you refer family and friends you can be our weekly champion and even make more money. Getting rewarded with the app is very easy. All you have to do is download the app for FREE from Google play store and register your details. Whenever you receive calls, the app would push ads to your incoming call screen and you get paid instantly! By sharing to family and friends using your referral code and becoming the highest referrer every week you get N5000 from us. That’s not all, taking surveys and polls and even for completing your profile on your MyAds account, you get more rewards, what do you have to lose? The accumulated points can be redeemed as airtime recharge to credit your phone, discounted gift vouchers and free coupons to your favorite stores. Imagine, you can even use your points to buy fuel. MyAds also offer brands and businesses a solution to target advertising. You can now have your ads seen by millions of people whenever they receive calls on their phones.